Medellín is one of South America's hidden gems, Colombia's second city and just under an hour’s flight North of the capital, Bogotá. It has a metropolitan feel but set in a lush valley it is nicknamed the ‘city of the eternal spring’. It stands in contrast to the other major cities of Colombia boasting a wealth of culture in its libraries, museums, nature reserves and gardens. It has gone through vast changes in the past few decades and is an emerging innovative epicentre of Colombia. Gaining notoriety due to cartel connections and the recent TV series from 2015, the Medellín of today is nothing like the one from the 1970s and 80s. Although nothing changes the fact that Medellín is Pablo Escobar’s hometown, you can now take a Pablo Escobar themed tour through the prominent but now peaceful areas of the city. However, the tourism board in Medellín doesn’t like to promote or encourage this! Instead, visit Medellín for it’s incredibly friendly people, the beautiful scenery and weather, tasty, filling and cheap food, world class public transport and stunning museums, libraries and public areas. Medellín understands its place in history but looks towards the future and wants to share this with all that are fortunate enough to visit. Study Spanish in the best part of the city! 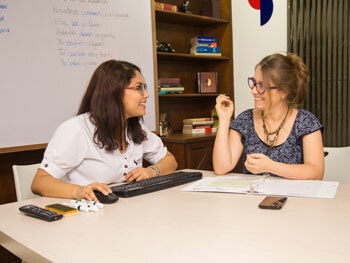 Our fantastic school in Medellín has a welcoming familial atmosphere where you can improve your Spanish. Located in the lovely El Poblado neighbourhood just a few minutes’ walk from the Lleras and Poblado parks, the school is found in a quiet street helping to ensure focused studying. At the same time our school is very close to the areas of interest in Poblado, which has many great restaurants, bars, hotels and places of interest. The school itself is in a large typical Colombian house and has six classrooms, a garden, courtyard and terrace where students meet and socialise together. There is also a cafeteria which serves delicious Colombian coffee, tropical juice and snacks to keep you going whilst you study! In addition, there is also library and free WiFi throughout the building. 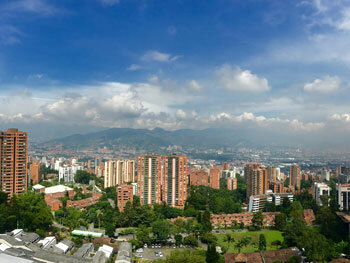 Like the majority of our Spanish language schools, we offer full immersion Spanish language courses in Medellín. Students can choose either 20 or 30 group lessons (maximum of 8 students per class), with an average of just 5-6 students. You can also combine group lessons with 5 or 10 private (afternoon) lessons per week. This is especially useful for those students that have specific areas of the language they want to focus on. For those students who are particularly interested in business, medicine or other areas of Spanish, our Medellín school will be more than happy to tailor the programme to your exact requirements. Alternatively choose 10, 15, 20 or 30 private lessons per week, which take place in the afternoons. DELE exam preparation and Bildungsurlaub courses are also available. All students, apart from complete beginners, will complete a short writing and oral test on arrival that our Medellín school will use to assign students to the most suitable Spanish course. At the end of your stay you will receive a certificate of proficiency together with a personalised report helping you with future Spanish language learning. We recommend combining your studies in Medellín with Cartagena. Contact us for a special price! 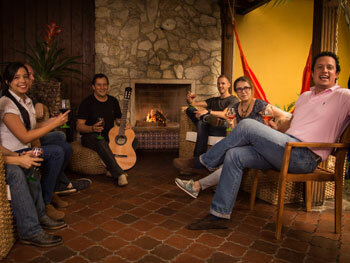 You can see first-hand what both cities can offer, creating an incredibly rich Colombian experience. Your Spanish lessons are guaranteed to continue at the same level across both locations and for extra-long stays our school will also provide the air ticket from Cartagena to Medellín! 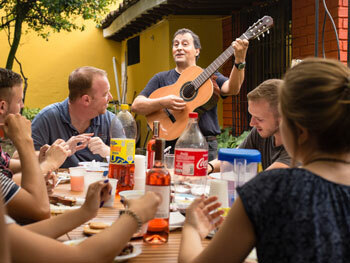 At our school in Medellín you would be welcome to stay with one of our lovely Colombian hosts, to practice your Spanish as much as possible outside of class time! As with our school in Cartagena, our Medellín school only works with loyal, friendly and welcoming families that are almost all within easy walking distance from the school. These local host-families are carefully selected for each student providing you with a lovely place to stay, breakfast and optional dinner (half-board). 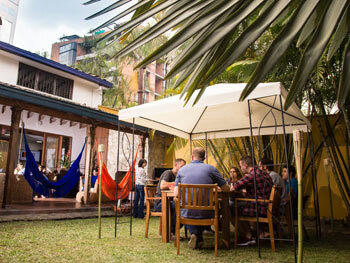 Another great option is to stay at the school’s on-site student residence in Medellín which has large rooms, a fully equipped kitchen, free WiFi, a garden with a barbeque and a fireplace for cooler evenings. 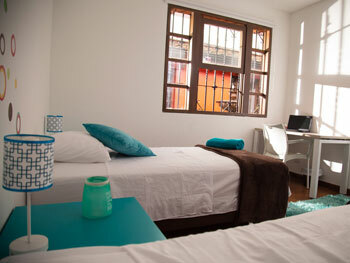 It is conveniently located just behind the school so you can roll out of bed and in to your Spanish class! We offer both standard (single bed) and superior rooms (double bed with a private bathroom). A delicious breakfast is included in the price. Accommodation can also be arranged in nearby hotels, hostels or shared apartments. Please contact us for availability. 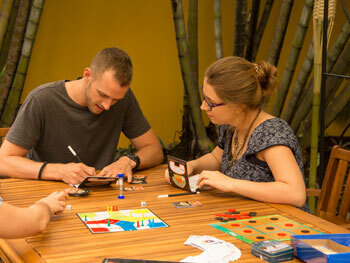 There are three cultural activities per week included in our language courses in Medellín. From bike tours, dance lessons and football afternoons, to cocktail evenings, local market visits and coffee farm tours including tastings, there’s something for all ages! Excursions and special activities can also be arranged at the weekends such as a Pablo Escobar tour, diving and visiting a chocolate farm. The Museum of Antioquia and the public space in front is definitely worth visiting, home to many large bronze sculptures by local artist Fernando Botero who also has statues in Parque San Antonio. Many more museums, galleries and green spaces are to be explored throughout Medellín. 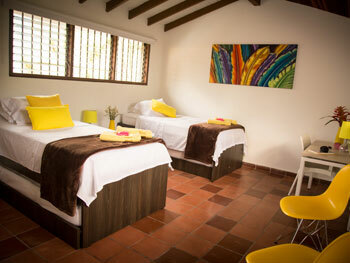 The Hacienda Nápoles, situated 20 min from the centre of the city is based within the ruins of Escobar’s former home. It is a curious yet fascinating place combining a zoo, an adventure park, butterfly enclosure, dinosaur statues and three pool areas for swimming. There are regular flights to Medellín airport. Transfers can be booked upon request.